The build to Kenny Omega vs. Chris Jericho continued at a press conference last night. 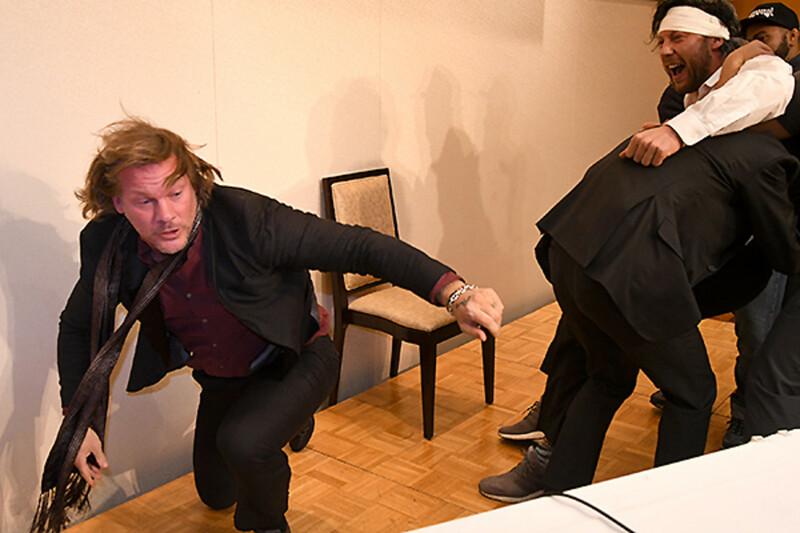 After Jericho made a surprise appearance and attacked Omega at NJPW's World Tag League finals, both were on hand for a Wrestle Kingdom 12 press conference overnight. NJPW announced that Kazuchika Okada vs. Tetsuya Naito and Omega vs. Jericho is a double main event at the Tokyo Dome show. Omega then spoke first, positioning their match as a fight between two people who think they're the best. Jericho was in the middle of answering his second question when Omega ran back in to attack him. Omega was punching him before being pulled off, then Jericho threw the press conference table at Omega. Jericho fought back until they were separated. Jericho got back on the microphone to say their match isn't going to be about star ratings or how many times they can go for their finishing move. He said it's a fight, and Omega is going to get the sh*t kicked out of him. Jericho said he's going to end Omega's career when they face off at the Tokyo Dome on January 4th. To further make his point, Jericho took a reporter's notepad and wrote down that it will be Omega's last match in Japan.